Looking out on changes good and bad throughout this century, Makawao has managed to cultivate a unique blend of old and new. What was once a rough and tumble cowboy town is now a lively community of entrepreneurs that mixes a general store and an old fashioned barber shop with health food, fine art, restaurants, and a collection of boutiques unrivaled throughout the Islands. Old timers and new agers live side by side in Upcountry harmony. Art, clothing, and gifts designed to delight every taste now decorate windows that once held homegrown produce and jars filled with three-for-a-penny candies. Park your car in the lot on Makawao Avenue and take a stroll through a town like no other you’ll encounter. And get ready to shop... with shops as distinctively different as this spunky little town itself, you’ll find 20 boutiques, 12 galleries, 9 eateries, hair salons, a bakery, a yoga center, Chinese herbs, cappuccino, a sportsbar, a general store, and a store that sells spices hot enough to inspire the name Volcano. Each year, on the weekend of the 4th of July, all the island gets together at Oskie Rice Arena to celebrate at the Makawao Rodeo. Preceded by the famous rodeo parade, paniolos from all over the state compete for prizes in bull riding, calf roping, barrel racing, and whatever unique rodeo fare our organizers deem judgeable. The parade, with stagecoach, floats, hula groups, antique cars, and good fun for all, displays some of the finest horses and riders on Maui. 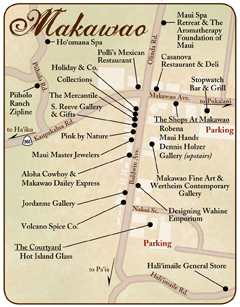 The art scene in Makawao has become quite a phenomenon and is on its way to rivaling Lahaina and Wailea in popularity. With galleries and studios up and down the streets, the New York Times has referred to Makawao as “the Sedona of the Pacific.” Chances are good that you’ll find many artists in the galleries themselves! Until the 1940s, the town of Makawao provided such things as groceries, kerosene, horseshoe nails, and dried squid to the surrounding farming community. When 34,000 servicemen from the 4th Marine Division settled in just over the hill, the town was changed... as was the community that supported it. When the marines went home, Makawao became a collection of closed stores with just a handful of survivors. Over the years, many new businesses came and went. It wasn't until the 1980s that things began to stabilize, and the Makawao of today took shape. Makawao is truly an historic cowboy town. The towns beginnings are from agriculture, farming and ranching and that tradition continues today.